This month marks the one year anniversary since my first post on AishaBeau.com, woohoo! My how a year flies by — so much has happened in my personal life, professional life and with this lovely website of mine. Throughout the process of running a beauty blog I have been exposed to a number of different brands, treatments, styles, products etc .. that have all reinforced my love of simply embracing who I am naturally. And manipulating products that enhance, not hide, my natural beauty. 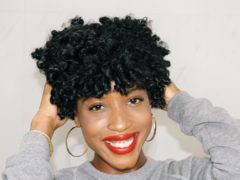 If you’ve read my post “Natural AND Relaxed, Not Versus” you know that my mom gave me a relaxer when I was 7 years old because at the time she was pregnant with my brother and juggling work. So keeping up a routine with my very thick and very long hair was difficult on her, which I don’t fault her for at all. Back in the day, a relaxer was IT. Ever since then, I’ve worn my hair straight — it’s my look. I didn’t hang on to the relaxer because I didn’t like natural hair, I did because I simply didn’t think I’d look good with it and I became accustomed to wearing it straight. Fortunately, even with a relaxer my hair has always maintained its thickness and length, so I felt no real need to go natural. However, for the past few months I’ve just gotten bored with it, and really want to try something new. 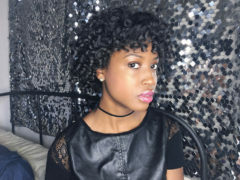 I also want to see the FULL potential of my hair, because I find natural hair to be so beautiful and extremely versatile. So, here we go! At this point, I’m 7 weeks without a relaxer. Here’s a photo of me last weekend before brunch — it’s my first flexi rod set as I transition. I’ve been reading quite a few articles and watching numerous videos on transitioning, so I definitely don’t expect this to happen over night. 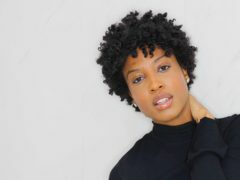 This also in no way means that AishaBeau.com will become a natural hair blog — I’m not a pro / guru, haha! However, I will be documenting my journey periodically as I see fit. The content will remain heavily geared to ALL facets of beauty including skincare, makeup, nails etc.. I just simply wanted to include you all on this ride with me 🙂 If you have any tips for me, please feel free to leave them in the comments section! Thank you so much for the advice! I believe it, and will definitely work on developing a routine. I appreciate the support!! Thank you so so much for the words of encouragement! I really appreciate it! I am so excited to begin this transition, and really hope it’ll be as joyous as you say ahaha! I’m sure it will, thank you!